This latest book from Specialty Press' superb Airliner Tech series concentrates on the Convair Twins family. This includes the radial engined 240, 340 and 440 as well as the various turboprop conversions such as the 580 and 600. In line with others in this series, it starts with a background history followed by development of the aircraft itself. In this section the concentration is on the radial-engined versions. There is then a systems section as well as on on the various interior designs and features. This is followed by a section on the initial delivery customers of the type. We then move on to the development of the turboprop variants; the 540, 580, 600, and 640 with their different turboprop engines. It is interesting to this reader that the 440 was designed from the start to be able to accept the changeover to turboprop power, a foresight that paid off well for Convair. There is a small section on airliner configured military versions to be followed by a chapter on second-tier operators. The appendices are on operators, losses and significant dates. There is a large color section which shows some of the fascinating livery worn by these aircraft. Throughout the book are quality images of the aircraft during development and service. There is also a small modelers section and while it is well done, it is incomplete as the author missed the old Airliners America 1/144 resin kit as well as the recent Proteus 1/72 versions. It is a book that I found not only a fascinating read, but a real feast for the eyes with all the great photographs. 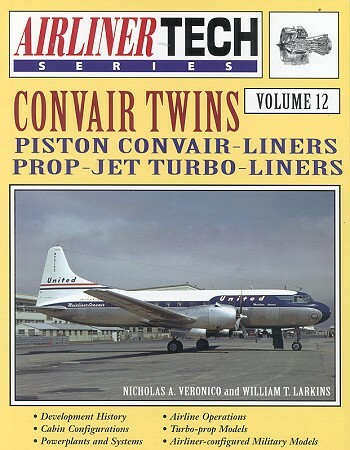 Many of us like the Convair twins and now we have a great book on the subject. Review book courtesy of , where you can order your copy of this and many other superb aviation and modeling books.